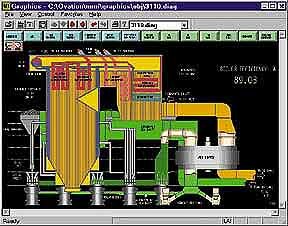 Optimization Software - Westinghouse Process Control, Inc. Source: Westinghouse Process Control, Inc.
SmartProcess Optimization Software provides power plants with solutions to operational, heat rate and regulatory compliance challenges throughout the full plant operating range. A hybrid combination of linear models, neutral networks and logic, the software offers a suite of intelligent software modules capable of working with any distributed control system (DCS). It is designed to enhance processes dynamically, providing consistent, reliable results during all plant operating scenarios, including startup, shutdown, load swings and baseload operation. Engineers implement the program through a series of steps that begin with the generation of a plant test plan, move through data collection, model development, installation, and DCS integration, and conclude with operation and customer acceptance. The software resides on a desktop personal computer or can be installed on a Sun Microsystems workstation. Westinghouse Process Control, Inc., 200 Beta Drive, Pittsburgh, PA 15238. Tel: 412-963-4000; Fax: 412-963-3644.